Why one professor is bringing the Declaration of Independence into the digital age in an effort to reach young people. One thousand years in the future, the America we know today is a very different place. Ruled by a dystopian monarchy that has shut down all democratic institutions, a small group of dissenters struggle to keep historical records intact, but they possess only bits and pieces of the important writings that once made up the foundations of American government. The group sends a young girl, Briana, back in time to the beginnings of the American Revolution to try and restore democracy for the future. Her only aid: fragments of a long-forgotten and misunderstood document she must piece back together, something called the Declaration of Independence. This isn't the plot to the next Holly- wood historical thriller, but the beginning of a unique new video game being designed by a team of educators, political philosophers, and software engineers at Harvard, led by Ed School Professor Danielle Allen. It might seem an odd direction for a political theorist who has published broadly in democratic theory, political sociology, and the history of political thought. But in an age where the life of Alexander Hamilton can be turned into a hit Broadway hip-hop musical, perhaps bringing the Declaration of Independence into the digital age might not be such a wild idea and, in many ways, is an ideal vehicle to make the declaration relevant and interactive for young people. "A video game is a living product," Allen says. "I think the biggest challenge thinking about a video game is actually trying to figure out what will be the sustainable organization that grows this over time. I think it is a good moment for a civics story that can connect to different parts of the country." Allen, a recently appointed professor at the Ed School, is also a professor of government at Harvard College and director of Harvard's Edmond J. Safra Center for Ethics. 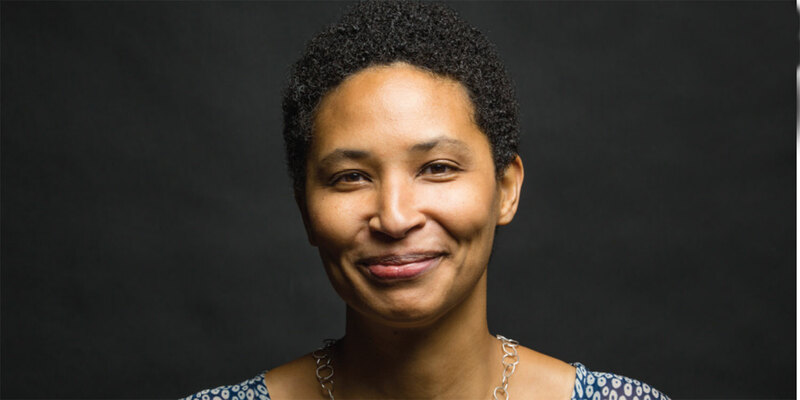 She holds Ph.D.'s in classics and government, is an opinion columnist for The Washington Post, and received a MacArthur Fellowship for her "ability to combine the classicist's careful attention to texts and language with the political theorist's sophisticated and informed engagement." This lifelong work teaching and writing about political philosophy culminated in 2014 with Our Declaration: A Reading of the Declaration of Independence in Defense of Equality. Allen wrote the book — which has since won several awards — in part to clear up several misconceptions about the declaration. "As I worked on the book, one of the things I realized is that we actually have a lot of collective confusion about the text of the Declaration of Independence," Allen says. "People tend to the think the sentence ends after the first three clauses — 'We hold these truths to be self-evident, that all men are created equal, that they are endowed by their Creator with certain unalienable Rights, that among these are Life, Liberty and the pursuit of Happiness' — and that's a mistake." In fact, the sentence continues and provides the heart of the document, offering up a theory of revolution and arguing for the basic right of the people to alter their government when that government is not working. In her line-by-line close analysis, Allen argues that we've lost touch with some of the most important aspects of the declaration. For instance, while most can recite the tenets of "Life, Liberty and the pursuit of Happiness," she says that we have forgotten what comes before: "that all men are created equal." As Allen writes in Our Declaration, "Political philosophers have taught us to think that there is an inherent tension between liberty and equality, that we can pursue egalitarian commitments only at the expense of governmental intrusions that reduce liberty. ... Because we have accepted the view that there is a trade-off between equality and liberty, we think we have to choose." One can feel the passion for the declaration in Allen's writing and voice. This is not a preserved document to be observed through museum glass, but a still-relevant reminder of how we all might better live our lives. Still, while Our Declaration did much to bring to light the importance of the declaration, Allen believed she missed a crucial opportunity with the book to reach a middle-school audience. Her solution: a video game to give kids an active understanding of the document. To trace the birth of a video game derived from one of America's best-known yet often misunderstood political documents, you have to begin in a classroom at the University of Chicago, where Allen was teaching the declaration almost a decade ago. In particular, her night class for adult students retaught her exactly how powerful each of the document's 1,337 words really is. "Every teacher has had the experience when you can tell the whole class is completely engaged, and every single session on the declaration was like that," Allen says. "There was a sense of urgency around it, and people kept drawing connections to their own life. There was a really palpable sense that what people were reading directly helped them think about things they were seeing and living through." Over the course of these sessions, however, Allen came to a painful realization. A basic tool that she saw as a means of social action to better understand the world when it is working and when it is not, the Declaration of Independence had been withheld from her students. "I was blown away at the beginning of these sessions to discover that these night students — low-income people, mostly African American, some Latino, a couple white students — had never read the Declaration of Independence," she says. "It just felt like a travesty, especially since the whole point of the declaration is for people with grievances to have a way of articulating them and changing the world." As she said on The Diane Rehm Show, when talking about her adult students, "Nobody else had ever made the suggestion that the text belonged to them." Now, Allen and her team will seek not only to bring the declaration to a wider audience, but to bring it to life. 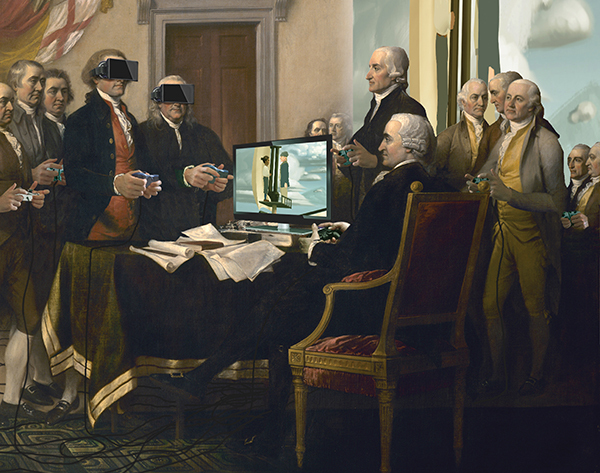 The video game, currently titled Portrait of a Tyrant, takes place between 1772 and 1776, leading up to the signing of the Declaration of Independence. The game's main player takes on the role of Briana, a young girl from the future whose job is to piece together the declaration and help save democracy for the future. "The purpose of the game in many ways is to tell the stories behind the grievances articulated in the declaration and to link them to the rights articulated 13 years later in the Bill of Rights," says Gabe Turow, a game designer and the project manager for Portrait of a Tyrant. "The two documents tell one long story when read together, and we're showing you how all the pieces relate through dialogues that are structured like puzzles, and the player has to identify which grievances are described by each story they encounter." Allen approached Turow to help design a game about the declaration, without anything much more specific than that. Turow says that Allen's book was a huge influence in shaping the challenge of turning political philosophy into a video game and organizing the game around the structure of grievances and rights. "We want to give kids a rich, active understanding of the declaration," Allen says. "The game turns around the grievances and the connection between the grievances and the declaration and the Bill of Rights. The rights are solutions to the grievances, and once you understand that connection, you can understand the logical structure of the Declaration of Independence." Turow says, "Danielle is one of the most naturally gifted teachers I've ever met. As smart as she is, what is amazing is how simple she makes complicated ideas." 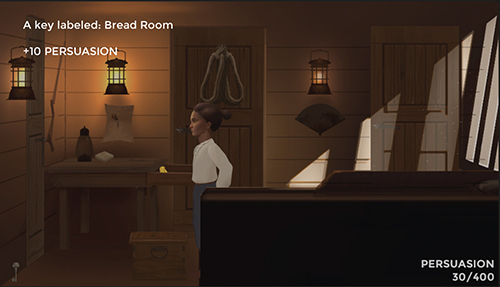 The game, which is being designed for students in grades 6–12, will let players traverse several historical events through increasingly difficult adventures to better understand the grievances of early Americans and draw connections to the real life impact of the declaration. Importantly, the game will stay true to Thomas Jefferson's words. "We are different on the landscape of historical video games in putting the text front and center," Allen says. "We're using the original language, we're not converting to modern vernacular, and the whole purpose is to teach kids slow reading to understand the declaration." Portrait of a Tyrant begins with Briana trans- ported back to the past, aboard a real historical British customs schooner, the Gaspee, just outside of Providence, Rhode Island. As she explores the ship, Briana eventually meets a smuggler, which leads to a discussion on unjust taxes imposed by the British government. Apart from the historical accuracy of the discussion, the detailed environment of the ship is stunning. "There was a lot of intense research about what would be seen in the rooms," Turow says. "We built 3-D models based on the architectural plans and writings we had of this ship that burned down in 1772." 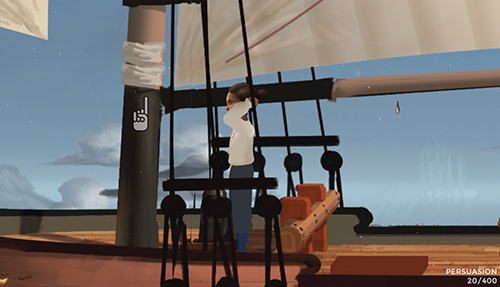 Of course, the game won't let young people or those unfamiliar with the text drown in details. The game will begin at an easy level, with just one or two grievances to tackle. Players will have the option to read the text in its entirety as well as to expand individual words to understand their meaning either in context or vernacular English. The goal is creating an engaging video game, not a textbook. "We've got a chance to do something really cool," Turow says. "We want it to be a good game. We worry about the pedagogy, but if we fail at the way we present this, there isn't a point of making a game if it's not fun." Emily Sneff, a research manager for Allen's Declaration Resources Project, says that telling the real and exciting stories behind the Declaration of Independence is one of the main efforts of the video game. "Creating a video game that literally transports students to the events surrounding the declaration, and causing them to interact with and hopefully empathize with historically plausible colonists, will allow students to see this list of seemingly outdated complaints with fresh eyes," she says. Current Ed.L.D. Student Jeff Curley, another member of the Portrait of a Tyrant team, says, "Civics is about shaping and navigating systems to accomplish our goals as a society. Educational games offer a mechanism for students to learn and apply civics principals." Curley is no stranger to educational games. He is co-founder and executive director of iCivics, a nonprofit organization that offers games and other interactive resources to help students acquire civic skills. iCivics features a growing network of 115,000 educators and reaches more than 3 million students annually. "Good educational games allow students to learn and practice specific skills that are critical for effective citizenship," Curley says. "Through Portrait of a Tyrant, students will experience how to identify societal grievances, craft solutions, and argue for change — skills at the core of civic agency." Interestingly, at a time in education when the buzz is around concepts like STEM and 21st-century skills, it is perhaps a nearly 250-year-old document that holds the most relevancies for students today in regaining a deeper appreciation for civic engagement and a better understanding of the world they are entering. "We are in a new phase because the Common Core, whatever its travails, has only three required texts: the Declaration of Independence, the Bill of Rights, and the Gettysburg Address," Allen says. "For the first time there is a requirement across most of the nation that the declaration be taught in full as a text, so we are trying to build out resources to make sure the teaching around that is effective and reaches up into the space of civic agency." The video game is currently in the prototype phase. The team has applied for a National Endowment for the Humanities grant to finish the first chapter out of a proposed six-chapter narrative. If all goes to plan, Portrait of a Tyrant will be released as a mobile game sometime in 2019. For now, Allen will continue to bring awareness of the declaration and push for a better understanding of the whole document. "To understand the declaration is to learn how to think about politics," Allen says. "It's not as if you've just acquired information and can check off boxes on a test. If you genuinely understand it, then I think you know what counts as a good political argument, and I think that puts you in a position to tell the difference between good and bad political arguments. And that seems to me like a very important thing for us to recover in our contemporary circumstances." For more on John Trumbull's painting, read "Wrong, Wrong, Wrong."